I'm coming from IOS, but I have an android tablet. I just got a used Sprint Galaxy S3 last night. The first thing I did was update OTA to 4.3, and then root it. I've installed Wakelock Detector and Greenify, which I've been using since last night and I've already hibernated some apps. 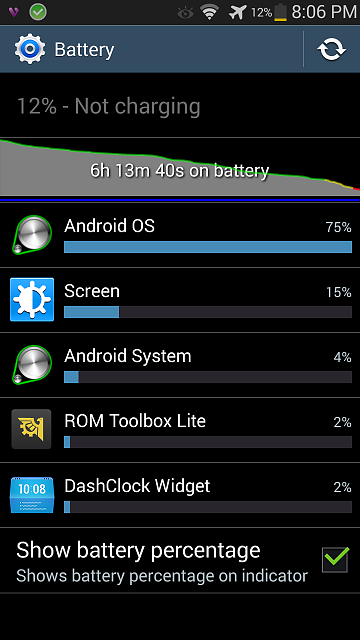 I've also installed ROM toolkit lite and frozen several apps to try to deal with the battery life. 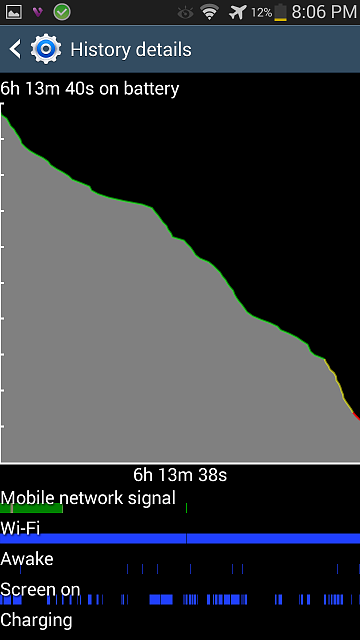 I've never seen battery drain like this on my tablet. The top 2 on there are screen and wifi, while on the S3 it's Android OS. It spent most of the day turned off, and I even charged it for over an hour at the computer. I don't plan on activating service on it for now. I'm just using it as an iPod replacement, so I also put it into airplane mode and just turned on wifi. Any ideas on how to fix the battery drain problems? 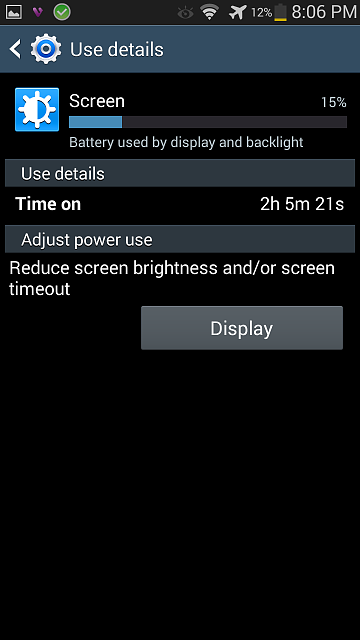 Check your battery stats to see if it's the screen. Been there, done that. Yep. That's what it is. The screen is brighter than before 4.3, so, it's using more power. In the OP's pics, the screen is only using 15%, and the OS is responsible for 75% His problem isn't the screen. OP, I would strongly suggest going back to stock and seeing where you battery life is. You'e made so many mods and installed so many apps that affect how the phone works, and how it uses battery, we'll never figure out what's going on. I have no battery saving apps installed and generally get about 12 hours before I get down to 30% left. And that's fully activated, with email syncing and a fair bit of use. I rooted it and hibernated 4 apps, but I hadn't frozen any apps until today when I saw the battery was draining so quickly. I just factory reset it and I haven't rooted, just installed Wakelock Detector. I'm going to let it run while I charge it tonight, and see how the battery life is tomorrow. I'll report back with how it goes, thanks for the help meyerweb. Here is the update. Did a reset and battery life was significantly better today. 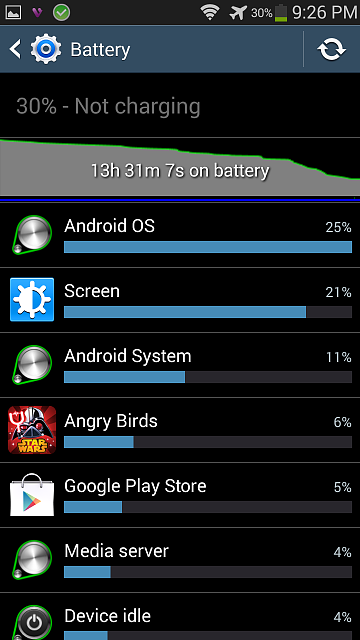 Still the Android OS is taking up a lot of the battery. Is this usage normal? The drop off near the end is due to me playing some Angry Birds, watching a little youtube, and reading reddit. After seeing how well it was doing I decided to try to put it to a better test. Android OS is often the highest consumer on my phone since the upgrade to 4.3, too, but I'm getting as good as, or slightly better, battery life than I did on 4.1.2. I think a lot of what used to be separate processes, which individually didn't use enough battery to show up on the list, have been consolidated into the OS. 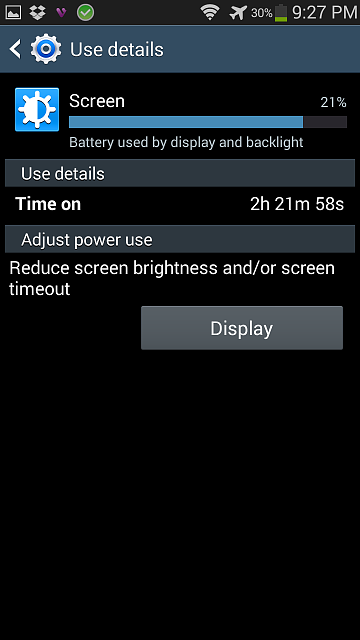 Your battery life doesn't really seem all that bad. It's on par with what I get, but without knowing how you use your phone it's hard to compare. The one thing that does seem odd is the VM wake time. Did someone leave you a very long message? Ok thanks meyerweb. My android tablet is stuck at 4.1.1 so I never see that in the battery stats, wifi and screen are always at the top on it. Yeah I got more than double what I got yesterday so I'm a lot happier with this. I was just hoping I could reduce that Android OS down. If not then that's ok my battery life is still doing pretty good. 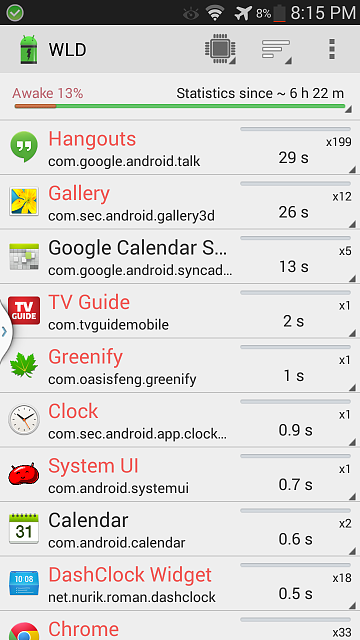 I've now greenified Amazon App store, and I've frozen all the Samsung and Sprint apps. I'm just using this as an ipod replacement for now so the phone isn't even activated. So that voicemail process also confused me, but it's frozen now hopefully that'll put an end to that. Do you know if it's ok to hibernate Google+? I don't use Google+ but I didn't know if that would interfere with any of the other Google apps, such as Gmail or Hangouts. As an ipod replacement I really just want to shut down all the phone functions, and other battery hogs to squeeze out as much battery life as possible. While also keeping it functional for messaging, web surfing, gaming, reading news, emailing, watching videos, and listening to music. You shouldn't expect to get the same battery life out of the phone as a tablet, if that's your basis of comparison. Tablets have much, much larger batteries. No no I wasn't comparing battery life between the two. 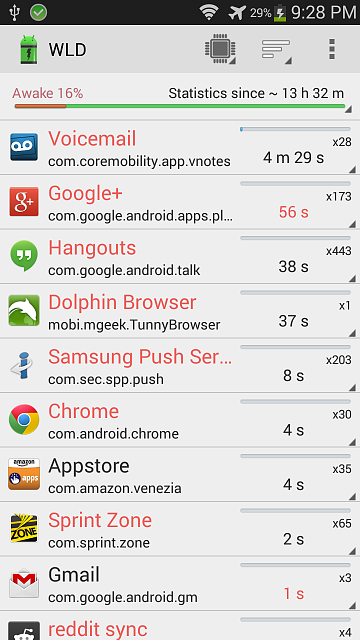 I was just comparing what took up the most battery life percentage wise in the battery stats. Actually I think this phone is getting better battery life than my tablet, but it's about 2 years old. OK, I understand now. Enjoy your S3. how can i get better battery life ? 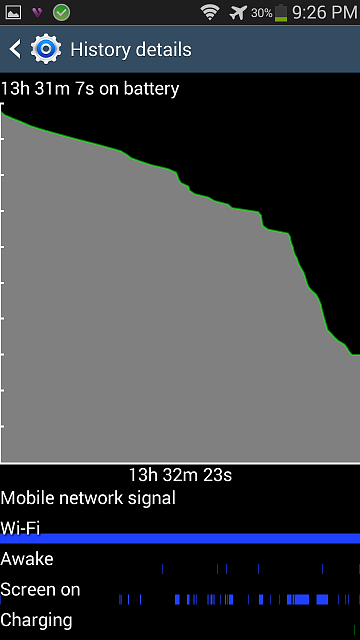 No Mobile Network and "unfortunately, the process com.android.phone has stopped"
Battery life on nexus 5?